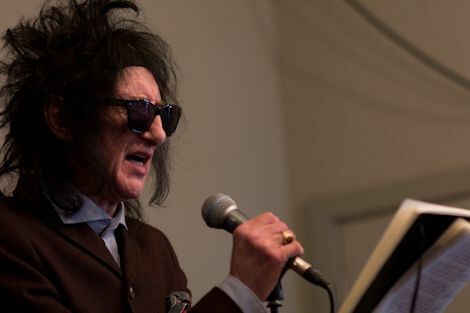 With a new generation of reverential youth and the ever-dependent old-timers out in force for a Friday sell-out, Getintothis’ Patrick Clarke heralds a welcome return for the legendary John Cooper Clarke. Poet, raconteur, chip salesman extraordinaire, there have been few careers like those of John Cooper Clarke, and that advert aside he can still command quite the share of reverence. With Arctic Monkeys the latest to quite literally sing his praises on last year’s cover of I Wanna Be Yours the much-exalted bard is still credible as ever, that advert aside, and Camp & Furnace faces a sellout ahead of his visit this Friday. It’s a welcome return for a Liverpool regular, it’s the now-65-year-old’s fifth Merseyside appearance in as many years, with the O2 Academy, Philharmonic and East Village Arts Club each treated to his distinctive vocal venom since 2010. That Arts Club date was dubbed “a spectacle to behold last year and given the man’s seemingly perpetual commitment to the circuit it’d be a safe bet to expect little in the way of any blunting. Clarke is an artist who’s rode the years better than most, and with a whole new generation of disgruntled youth still falling for his spindly charms this Friday’s show is set to be testament to one of Britain’s true icons and still an influence as mountainous as ever.